X Marks The Spot Video Slot Guide & Review - Casino Answers! X Marks the Spot is a 5-reel, 20-line video slot developed by Vegas Technology, featuring scatter wins, wild substitutes, free spins and a bonus game. 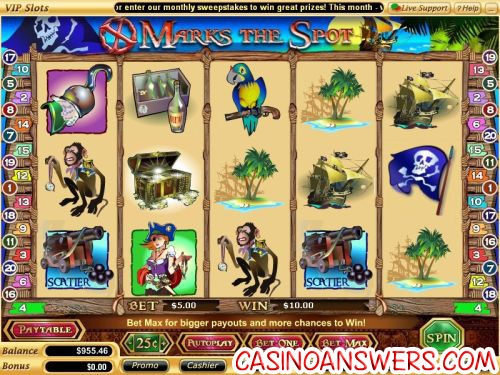 You can play the X Marks the Spot video slot at US-friendly online casinos Go Casino and Caribbean Gold Casino. The phrase “X Marks the Spot” is a phrase that comes from marking the location of a treasure on a map with an “X.” And of course, who is the group of people notorious for searching out treasure? If you guessed pirates, you’re right on the money, landlubber! 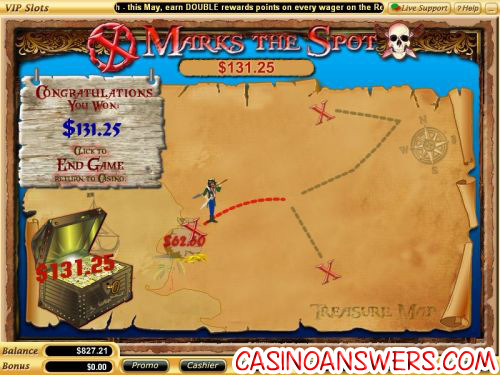 X Marks the Spot is a pirate-themed video slot based on pirate treasure hunts. Symbols on the X Marks the Spot video slot consist of: Pirate Captain (wild symbol), Cannon (scatter symbol), Treasure Map (bonus symbol), Treasure Chest, Skull and Crossbones Flag, Pirate Ship, Female Pirate, Parrot, Hook, Monkey, Island and Bottles of Rum. To start playing the X Marks the Spot video slot, set your bet per line. Available coin values for you to choose from are $0.01, $0.05, $0.10, $0.25, $0.50, $1, $5 and $10. You can also set the number of active paylines (up to 20) by using the “Bet One” button or clicking on the buttons at the side of the reels. You can bet anywhere from $0.01 to $200 on X Marks the Spot. To play all 20 paylines and spin the reels, use the “Bet Max” button. To play with your current settings, use the “Spin” button. The top fixed jackpot on the X Marks the Spot slot machine is the Pirate Captain symbol. Five of these symbols will win you the 4000 coin top jackpot. The Pirate Captain symbol is also X Marks the Spot’s wild symbol and will substitute for any symbol (except for the scatter and bonus symbols) to complete a winning combination. Also, the Treasure Chest symbol is another big jackpot at 1000 coins. The X Marks the Spot scatter symbol is the cannon. Scatter payouts are multiplied by the total bet, rather than the bet per line as the payline wins are. If three or more scatter symbols appear on the reels, you will dig up the treasure of 15 free spins with a 3X multiplier. All wins, except bonuses, are tripled during the free spins feature on X Marks the Spot. More free spins can be won during the free spins feature. When the Treasure Map bonus symbols appear on reels 1, 3 and 5, you will trigger the X Marks the Spot bonus game. In the game, you will see a map with several different X’s. Choose one of these X’s to search for treasure to win a prize. You will get to do this three times and then all of your prizes will be added up. You will be offered to accept your prize or open the treasure chest to possibly win a bigger prize. The bonus round prize will be multiplied by the number of paylines crossing through. From our experience, we triggered the bonus on our third spin on X Marks the Spot. We collected a prize of $62.60, risked the prize for the prize in the treasure chest and won $131.25! X Marks the Spot has a skill stop feature that you can access at any time once the first reel has stopping spinning. The “Stop Spin” button replaces the “Spin” button during a spin. When you stop the spin, any winning combinations you receive will be paid out to you. To access X Marks the Spot’s autoplay feature, hit the “Autoplay” button in the middle of the video slot’s game buttons. You can set the number of spins (5, 10, 25, 50, 100, 250 or 500), the number of seconds between spins (0.25, 0.50, 1, 1.50 or 2), stop once all spins are complete, stop when the jackpot is won, stop if any win exceeds or equals ($50, $100, $150, $200 or $250), stop on any win you receive and stop if your credits increase/decrease by $50, $100, $150, $200 or $250. You can stop the autoplay feature by using the “Cancel Autoplay” button that replaces the “Autoplay” button during autoplay spins. X Marks the Spot is a real treasure of a video slot. It’s got a free spins feature with a steal of a multiplier (3X) and a bonus game where you can win yourself quite a bit of gold. Speaking of free cash, we recommend you sign up at Go Casino and take advantage of their $20,000 signup bonus – quite possibly the best casino signup bonus around, especially of the US-friendly online casinos. To sign up, make your deposit and play X Marks the Spot, visit Go Casino! Are US players welcome to play the X Marks the Spot slot? Yes, US players are invited to check out both Go Casino and Caribbean Gold Casino, sign up, make your deposit and play X Marks the Spot. What special features are found on the X Marks the Spot bonus slot? X Marks the Spot has a treasure hunting bonus game and free spins feature with 15 free spins and a 3X multiplier. With the 3X multiplier, all of your winnings in the free spins feature will be tripled. I’m a Macintosh user. Is there an instant play version of this slot game? There sure is. You can find an instant play version of the X Marks the Spot video slot at Go Casino. If you experience any problems with the X Marks the Spot Flash game, make sure you have the latest version of Adobe Flash Player installed on your computer. I’m looking for more pirate-themed slots. Where can I find them? There are several different pirate slots available at online casinos, so there is no shortage of selection. You can read our Pirate Slots Review and Captain’s Treasure Pro Review. Besides the games we have reviewed, Cryptologic has Buccaneer’s Bounty that you can play at InterCasino. Microgaming has Skull Duggery that can be found at Gaming Club Casino. Net Entertainment has Ghost Pirates and Pirates Gold at Tower Gaming Casino. You can play Goldbeard at Lucky Red Casino.